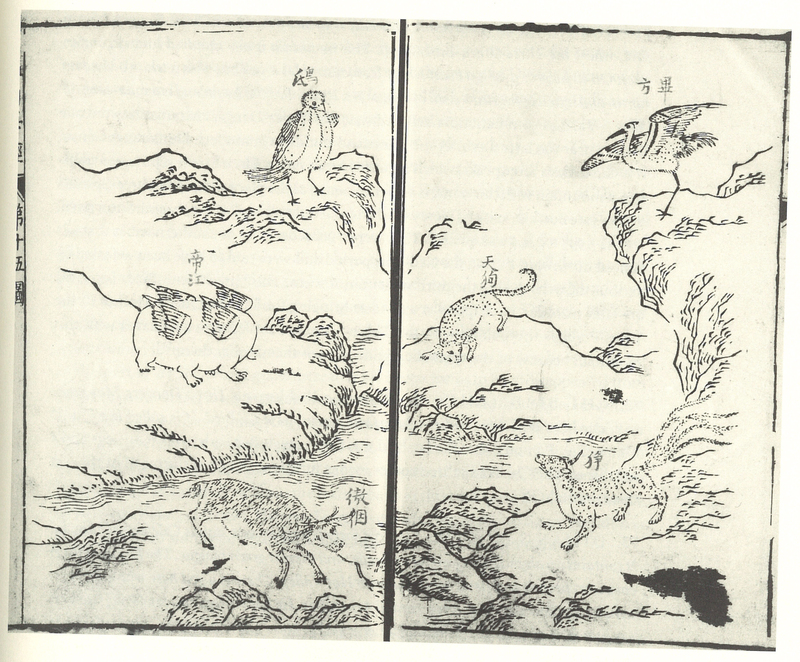 In ancient China, it was believed that occurrences in the sky directly mirrored those on earth. As the Son of Heaven, the emperor's legitimacy rested on his ability to foretell celestial phenomena, in particular the appearance of unexpected events. Failure to foresee events had serious consequences, and one missed eclipse in 2136 B.C. resulted in the execution of two court astronomers. 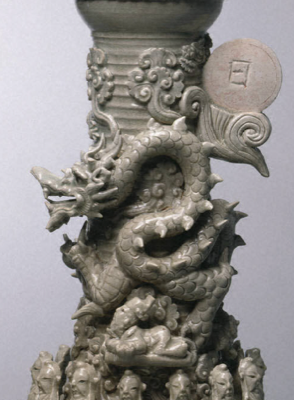 Solar eclipses were especially feared, and it was thought that a great dragon (fig. 1) was trying to devour the sun. As recorded in a text compiled between the fourth and first centuries B.C., solar and lunar eclipses were also believed to have been caused by a beast "whose form resembles a wildcat but with a white head. It is called the Celestial Dog [fig. 2] and makes a sound like a cat. It can repel evil forces." Forewarnings of eclipses were deemed vital so that preparations could be made for people to make noise in order to scare away the creatures trying to eat the sun or moon. In Chinese, the terms for solar eclipse (rishi 日食) and lunar eclipse (yueshi 月食) both end with the character "to eat" (shi 食). The earliest historical record of a total solar eclipse in Japan dates to A.D. 628, and in Korea independent reports of eclipses begin around A.D. 700. 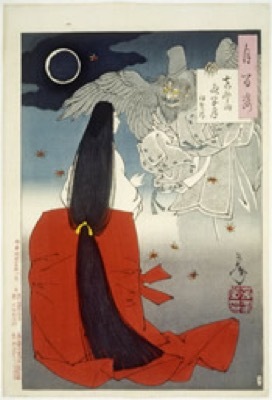 Ceremonies were performed to save the sun and moon from being consumed, and artistic representations often associate eclipses with spectral apparitions, such as in Yoshitoshi Taisō's depiction of the heroic lady Iga no Tsubone confronting a ghost (fig. 3).